Our client West Island Palliative Care (the Residence) provides a unique environment of love and personal care to people who are facing the end of their lives through terminal illness. The charity has an active and passionate support base, many of who have had family members and close friends experience a terminal illness and may have also seen firsthand the dignified and unique end of life experience that the Residence provides. For the annual fall appeal in 2015 the charity asked Fundraising Direct to create a direct mail pack that would not just generate cash gifts but would also attempt to engage supporters in a meaningful way with the Residence. From the fundraising support provided to the Residence over a number of years, we have gained valuable insights into the charity’s supporter audiences. We know that donors value and recognise the importance of the Residence’s mission to create a real home environment for people who are terminally ill. They want to hear from real people and their personal family experiences of the Residence and they are often willing to do more than just send in a donation to show their support for the charities work. Using these supporter insights, Fundraising Direct created a direct mail pack with three key objectives. First we wanted to build the fundraising proposition around an aspect of the Residence which encapsulated the home environment that the organisation strives to create for terminally ill individuals and their families. Secondly we want to create a persuasive ask around this aspect of the service. Finally, we wanted to find a way to further engage supporters in the work of the Residence. 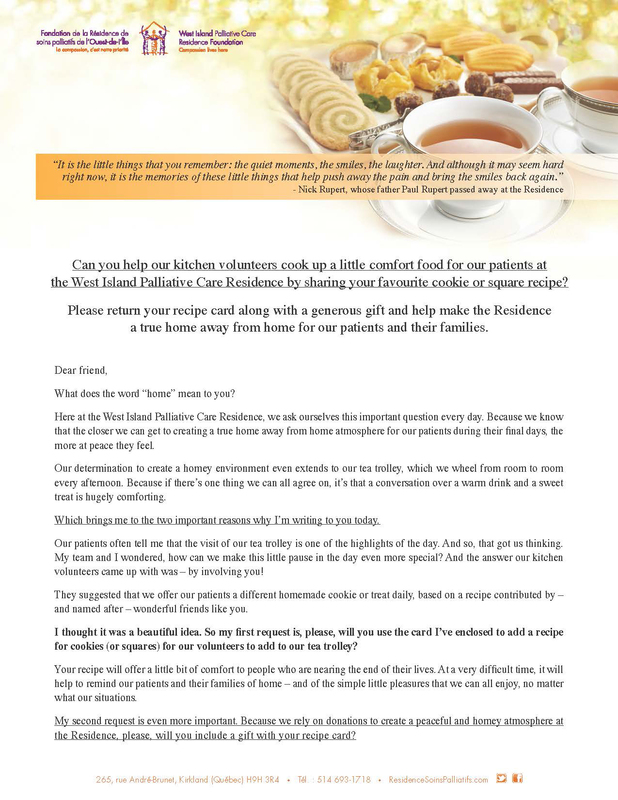 We built the copy for the appeal pack around the home cooked meals that are provided to individual people and their families during their final days at the Residence. In particular the appeal focused on how the Residence prepares freshly baked cakes, cookies and other sweet treats and organises a daily sweet trolley that visits all the rooms in the Residence. Fundraising Direct built the appeal around home cooked meals and sweet treats served at the Residence. We used a real case study to demonstrate how small things like the Residence’s sweet trolley with home bakes treats goes to help create the home away from home environment which is so important to people living out their final days. Supporters were asked to provide a cash gift to show their support to the charity. This donor engagement pack included a recipe for one of the sweet treats regularly provided to residents – a recipe for Bob’s Peanut Butter Cookies. To show the charity’s thanks to their supporters and to build their engagement, we included two further items in the appeal pack. 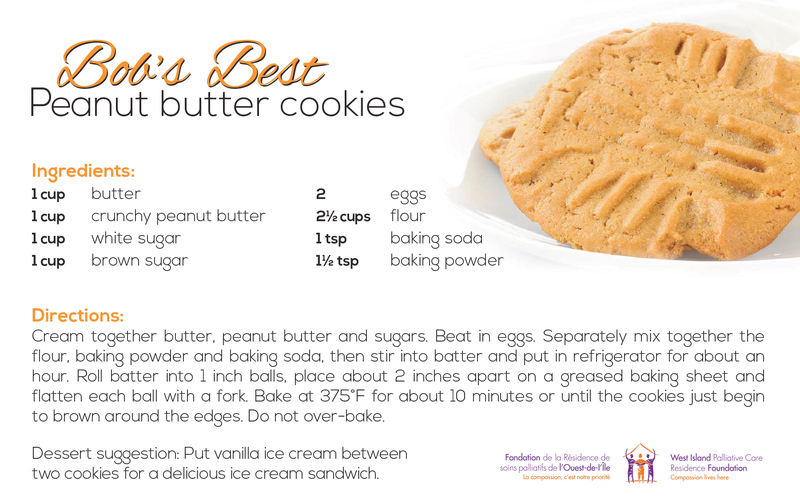 The first was a recipe for one of the sweet treats regularly provided to residents – a recipe for Bob’s Peanut Butter Cookies. Secondly we also asked supporters to send a recipe for their own favourite sweet treat so that these could be prepared for terminally ill people at the residence. The appeal was sent to the full active cash supporter file. 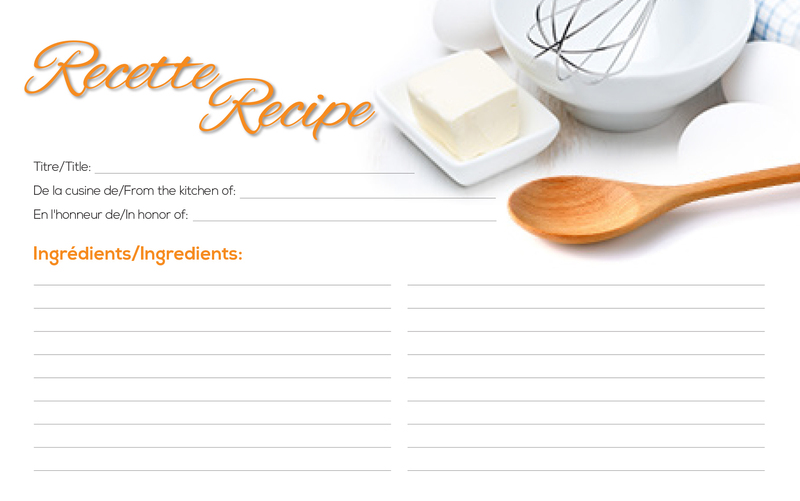 The pack invited supporters to share their own favourite recipes. Response to the appeal was exceptional with the charity beating the appeal targets and generating the highest ever response to a direct mail pack. Many supporters sent in a generous cash gift and provided their own personal recipes to be prepared for people at the Residence. The pack generated a 19.25% response vs the 11% target. Average gift value was $126.50 vs the $115 target. Overall the pack generated 46% more income than originally budgeted.